Keznamdi, the Jamaican dancehall artist who made the only worthy "Classic Man" cover, has done it again with a damn near perfect flip of Rihanna's "Work." Titled "Herbs," it finds Keznamdi putting "a little more roots" into Rih's chart-topping pop-dancehall hit. 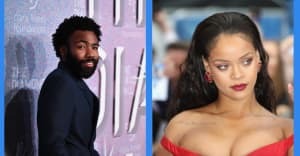 "To see dancehall and Jamaican culture on that level, sung by Rihanna and Drake—I really loved it," he said last week on the phone from home, explaining that he laid the track down in an hour after a week of listening to Anti on repeat. And so, his take has the same unworried, tuneful vibe of the original, but a new subject: marijuana. I steam up the herbs, he sings, repeating "herbs" until the consonants melt into the air. " Today, The FADER has the honor of premiering the song's video—which, much like the track, plays closely off the original's second act. The scene is set basically the same—a simple room and a purple glow—but it's kitted out with chalices, homegrown plants, and an appearance from reggae star Keida. "I wanted to put a little more roots in there, so you see a lot more Jamaican culture," he said, noting that the song is a little political too. "Marijuana advocacy is very special to me so whatever way I can get the message to people I try to and I believe this also served as a good opportunity."